Preheat oven to 120°C/240°F/Gas mark ½. Put the egg whites into a spotlessly clean mixing bowl of a kitchen aid and beat on full speed until quite stiffly beaten. Turn the speed of the mixer down and slowly add the sugar-adding just a little at a time. When all the sugar has been incorporated, add the vanilla essence, cornflour and vinegar and give one final whisk on high speed. Meanwhile prepare your tin. Line an oblong baking tray (13 x 9 inches) with parchment paper. You can either spread all the mixture out on the baking sheet or using a piping bag, you can pipe the mixture out into attractive individual shapes. Bake in the oven for 1 hour until the meringue mixture is very firm to touch but still soft on the middle. I normally leave mine to cool in the oven with the door ajar. When cold transfer to a serving platter and decorate with some freshly whipped cream. 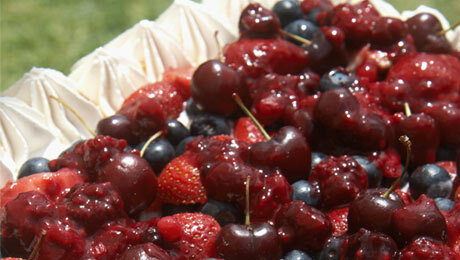 Pile the berries on top of the pavlova and serve immediately!